Use Aluminium for a Canopy? Why Not? Which is better, aluminium or steel? It’s a fairly common debate now in construction, engineering and design. Advanced aluminium alloys are emerging as the materials of the future in manufacturing; there’s also die hard steel fans who swear by the construction industry’s metal of choice for decades. Whatever side of the debate you favour, there’s several things you need to consider before making your decision. We’ve compared aluminium and steel canopies on aesthetics, ability to customise, lifespan, ease of maintenance, sustainability and cost. Read on for the ultimate guide to your canopy choice! This image says it all. On the left is a canopy manufactured from lacquered, powder coated aluminium alloy. On the right is a canopy manufactured from powder coated steel. Both are modular designs, bolted together (in the right image you can see the screws). The aluminium model in the left image has hidden fixings, integrated guttering, and downpipes hidden in the columns. In the right image of the steel model the guttering and downpipes are clearly visible. An aluminium canopy has a clean, modern profile compared to a traditional steel option. Both steel and aluminium can be manufactured bespoke and in modular canopy designs. A modular design allows cost-effective customisation to your needs; while a bespoke option is more expensive but exactly fits your design. 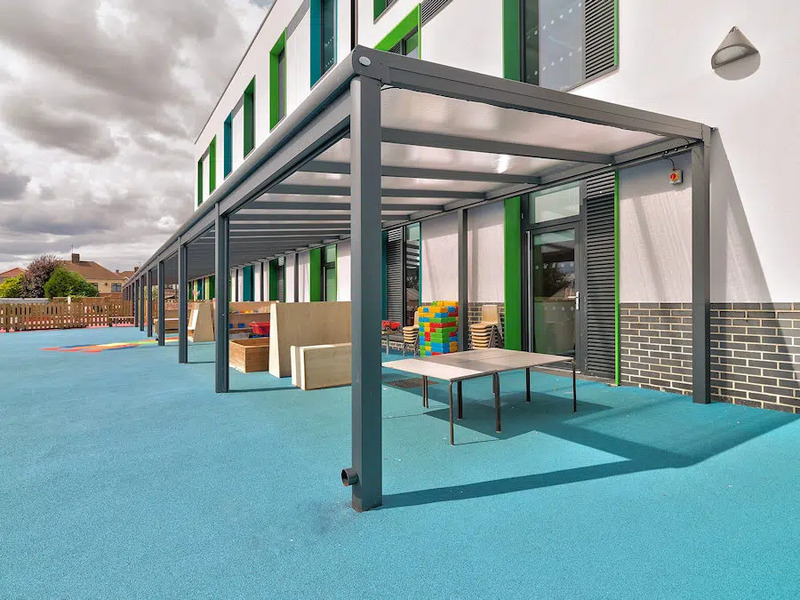 We generally recommend a modular canopy – its customisation abilities are almost as unlimited as bespoke, but as it uses standard components it’s a lot more cost-effective. Steel is touted for its strength and durability; but, for maximum effectiveness it must be galvanised, then powder coated or painted as it rusts when exposed to air. 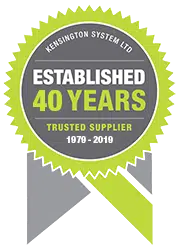 Aluminium alloys form a protective layer of aluminium oxide on their exposed surfaces, so the canopy lasts a lot longer, and galvanising and powder coating are not actually necessary. Nearly every structure in the built environment contains steel in some form – a testament to its longevity and reliability. But that doesn’t mean you can discount aluminium. According to this article almost all the aluminium ever produced is still in use today, even going back to the 1920s when it was first used as a building material. The same article points up that a lot of steel-and-concrete infrastructure from a later period has now deteriorated to the point it needs replacing. Aluminium canopies like Spaceshade are guaranteed for 25 years, and they’re designed and built to last a lot longer. Less dense than steel, they can be built to equivalent strength with a similar or smaller footprint. Steel is extremely strong, but with the strength comes a price; maintenance. Its tendency to rust when exposed to air requires initial galvanising and regular repainting, especially in an outdoor environment with fluctuating temperatures and humidity. Aluminium alloys are high-performance (that’s why they’re used for aircraft parts) and require almost no maintenance, since the self protective layer of oxide prevents further reaction with the air. The maintenance costs for a steel canopy far exceed those of an aluminium one. Experts believe that more steel is recycled every year than aluminium, plastic, glass and all other commonly recycled materials put together. However, recycling steel is a complex and difficult process that requires a lot of energy and resources. Aluminium however, is much easier to recycle and treads much more lightly on the planet. Its been called ‘one of the most energy efficient and sustainable building materials’ – an aluminium canopy is 100% recyclable. There is no denying that steel is a cheaper option than aluminium. But before you value-engineer your canopy, consider that the weight of the steel canopy will require bigger foundations; more posts to carry its weight; and regular maintenance to keep it looking good. Canopies manufactured from aluminium alloy don’t rust, so little maintenance is needed. They are more lightweight than steel, so smaller foundations are required; and they can carry up to 7m spans between posts. Consider the hidden costs before you make that decision. Aluminium is becoming a serious contender against steel in the construction industry. Its lightweight structure, low maintenance and easy-to-work with properties are gaining positive publicity as more and more people recognise the benefits of using aluminium in their buildings. Before you go with what you’ve always done, consider the benefits of using a durable, sustainable and low-maintenance material could have for the aesthetics, lifespan and carbon footprint of your building.